The Heavenly Choir by Gustav Klimt, ca. 1902. 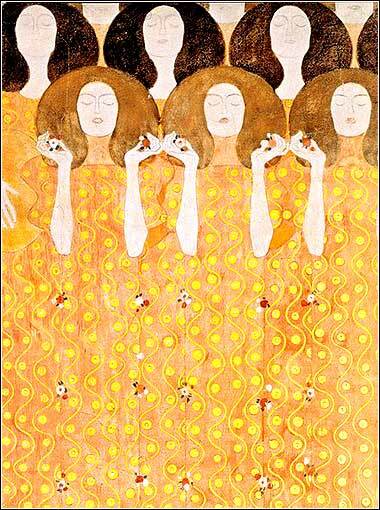 The radical stylization of the “Vienna Secession” movement dominates Klimt’s vision of the welcoming angels of heaven. It is perilous to separate thinking rightly, from acting rightly. He is already half false who speculates on truth and does not do it. The penalty paid by him who speculates on truth without doing it, is, that by degrees the very truth he holds becomes a falsehood. King Solomon said to Abiathar the priest, “I should kill you too, but I will allow you to go back to your fields. I will not kill you at this time, because you helped carry the Ark of the Lord God while marching with my father David. And I know you shared in all the hard times with him.” Then Solomon removed Abiathar from being the Lord’s priest. This happened as the Lord had said it would, when he was speaking in Shiloh about the priest Eli and his descendants. When Joab heard about what had happened, he was afraid. 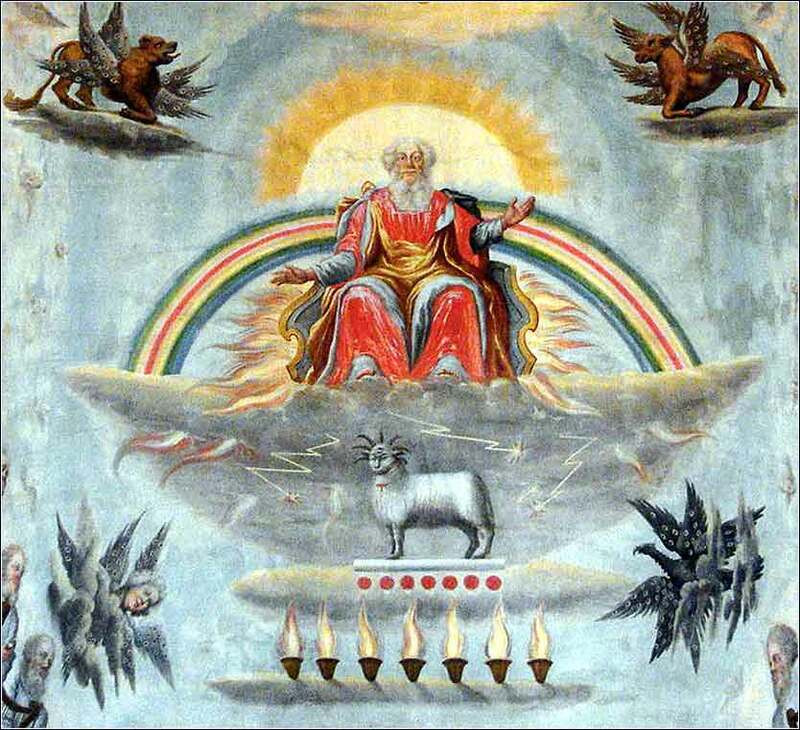 He had supported Adonijah but not Absalom. So Joab ran to the Tent of the Lord and took hold of the corners of the altar. So Benaiah killed Joab, and he was buried near his home in the desert. The king then made Benaiah commander of the army in Joab’s place. He also made Zadok the new high priest in Abiathar’s place. Solomon continues to take care of his first order of business, which is the first business of any clever king: insuring that his enemies are neutralized. In Solomon’s case, however, we must see that his actions were righteous and according to the will of God. A cynic might see typically ruthless political motivation, but Solomon is acting well within God's law. One could make a case that his actions were compelled by God. Even in the political arena, he would be justified in killing those who conspired to deprive him of his crown. The Jewish king was truly anointed by God himself, for the Hebrews were his holy people. Scores of kings all over the world would later claim divine right to a throne, without any actual merit, but the King of Israel had the unique status of actually serving at God's will. This becomes important to Christ's acceptance by the Jews a thousand years later; Matthew’s Gospel, remember, begins with a genealogy proving Jesus’ lineage back to David. Aside from their plotting against Solomon, though, both Abiathar and Joab must be punished for other, earlier offences. Joab is the easier to see; on his death bed, David commanded Solomon to “arrange a bloody death for him.” (1 Kings 2:9) Joab's dealings with Abner and David were complex, and it is not totally clear that he was wrong to kill Abner. But David, acting as king, had found Joab guilty of murder and Solomon was bound by David’s verdict. If it would take a page to fully explore Joab’s guilt, it would take two to flesh out Abiathar's odd position. In a nutshell: He was the last in the line of Eli, a great high priest whose two sons were corrupt. Because of the sons, God himself had ordained that Eli's line would lose the right to become high priests; and thus, Solomon is correct to remove him. Sparing Abiathar's life is an act of righteous mercy. 1 Peter 2:9: [Y]ou are a chosen race, a royal priesthood, a holy nation, a people for his own possession, that you may proclaim the excellencies of him who called you out of darkness into his marvelous light.